Wonderful place to stay. Right when we arrived we were greeted with an incredible Cuba Libre (maybe the best we had in Cuba) as Jorge sat down with us and talked to us about Cuba, how long we'd be there and other things like that. He then gave us great advice and recommendations based on our discussion. Jorge was a fantastic host and extremely helpful with everything we could need including directions, prices we should pay for things, places to see, best places for food/drinks/cigars, etc. Cuba can be a little difficult to travel to, particularly for Americans, as there isn't a lot of good information and websites. Because of this, it made Jorge all the more incredible for us. He speaks great English and could give us answers and advice on so many things. With a lot of places, the Casa owner has another job and they come and go, with Jorge, this is his job so he takes great pride and care to make sure you have a great experience. Don't hesitate to stay with Jorge and this amazing casa. How was your room? : Great room. Had A/C which is a must in this hot climate. Has a safe in the room which is nice for keeping your passport, cash, etc. Bed was nice, room was clean, has warm water in the shower. You won't be disappointed here. How was the food they offer? : Breakfast was great. Costs 5 C.U.C. and we got coffee, tea, fruit, juice, eggs and a ham & cheese sandwich. Other services they offer: Helps you book taxis, tours, other casas when his is full, casas in other cities, etc. Jorge is extremely friendly and knows everyone. If you have questions or need help with some other service, I would bet on Jorge to be able to help you find the right person and book it for you. 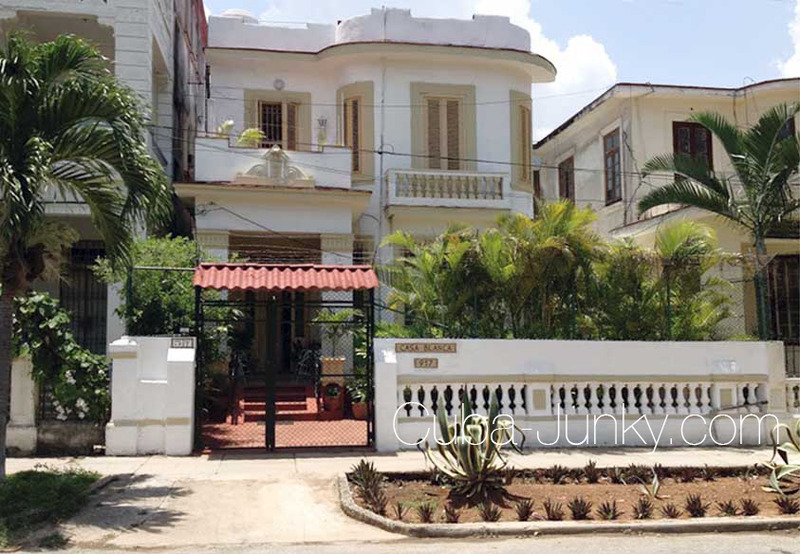 Beautifull casa in a fantastic colonial building. We had the room in the front next to the terrace. This is a perfect room with a shower. Breakfast was great and the owner, Jorge, and staff were very nice and helpfull people. How was your room? : Great room with own bathroom. How was the food they offer? : Its a bed and breakfast so we did not have dinner. Breakfast was great with fresh fruit, eggs and sandwich. Other services they offer: Offered us a great service with all our questions. We paid for a package which included tours, sightseeing, daily breakfast, drinks, some dinners, some lunches all transportation. My review: We were 10 from Wisconsin. Six of us stayed at Casa Blanca and 4 others near by. We lived the concept, "MI CASA ES TU CASA". The constant warmth and caring smile Jorge had will never be forgotten. It's amazing how he has managed his life in Cuba and show such zest and gratitude for life. Paradise is not found anywhere in our world but in our inner world. Jorge and many Cubans are doing just that! And thanks to that spirit, Cuba is making a comeback. God Bless Cuba! How was your room? : Cozy and reminded me of visiting my grandma in Sucre, Colombia when it was La Mojana. Did not mind the dog concert outside at a distant at night. Then in the mornings, crowing sounds from Mr Rooster was very nostalgic from my childhood. The very high ceilings and flowing colorful curtains was romantic and I felt I was living in another era. The single drop at-a-time shower from time to time filled me with gratitude that we still have H2O on the planet! How was the food they offer? : Food was very good and happy for the tropical fruits and daily eggs. I would recommend a buffet style. This would avoid waste of food since not everyone ate everything served to them. Other services they offer: We received a cell phone to use while in Cuba. Wonderful touch of welcoming. Jorge joined us for a few of the events. 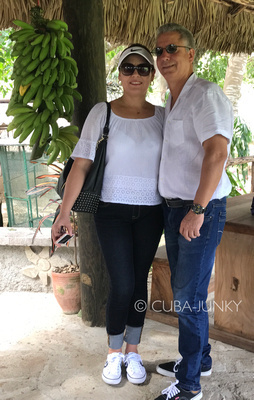 We rode horses, took a joy ride on colorful antique cars, had dinners in beautiful places, lunches overlooking the sea, saw 400 year old trees, saw the dancing cabaret at the Hotel Nacional, beautiful art work everywhere we went, mojitos, great rice and beans! 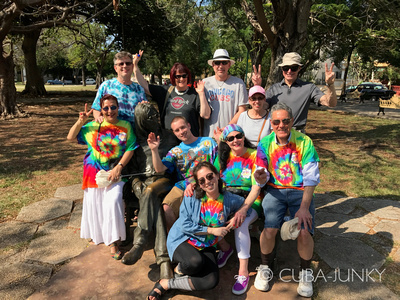 Other comments: Thanks to Cuba Scuba we had this trip well organized with plenty of things to do and see. Hemingway was a big part of our tours as well as the cigar making process. All our guides spoke more than one language. They were well prepared and educated lawyers, architects, botanist, historians and most of all friendly, adding to our experience.